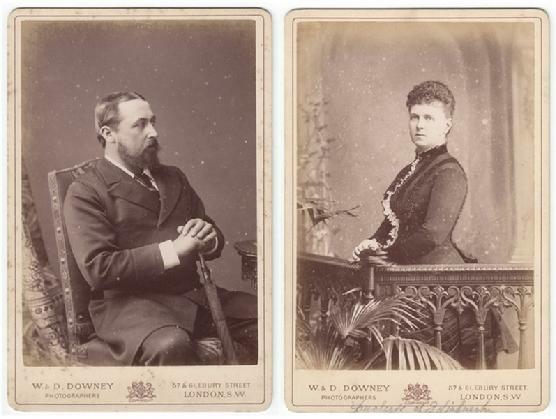 Two cabinet card portraits, one showing Prince Alfred (1844-1900) Duke of Edinburgh, fourth son of Queen Victoria, the other showing his wife, Princess Marie (1853-1920), Duchess of Edinburgh and Grand Duchess of Russia. Prince Alfred (‘Affie’), Duke of Edinburgh, was born in 1844 at Buckingham Palace, the 4th child of Queen Victoria, and the only one not born at Windsor. The Queen wrote when he was only a year old that Alfred was the possessor of a ‘very good manly temper’ which he reportedly retained for the rest of his life. In 1867-68 he made an extended tour of Australia where he was the victim of an unsuccessful assassination attempt by a Fennian, an Irishman named Henry James O’Farrell, at Clondarf in New South Wales. In 1874 he married Maria Alexandrovna, Grand Duchess of Russia. In 1893 he succeeded his uncle Ernest II as reigning Duke of Saxe-Coburg and Gotha. Prince Alfred died 30 July 1900 at Schloss Rosenau, near Coburg. Princess Marie, Duchess of Edinburgh, was born Maria Alexandrovna, Grand Duchess of Russia, the only daughter of Tsar Alexander II and Marie of Hesse-Darmstadt. In 1874 she married Prince Alfred, Duke of Edinburgh, fourth son of Queen Victoria. The Queen did not meet the Grand Duchess before the wedding, which took place in St Petersburg in 1874, the bridegroom appearing in the uniform of a Russian naval captain, much to the Queen’s displeasure. However, when she eventually did meet her new daughter-in-law, she liked her very well, finding her good-natured, natural and intelligent. The satisfaction was not mutual. Her family in Russia heard that the Duchess found her visits to Windsor and Osborne ‘boring beyond belief,’ that English food was ‘abominable,’ and London, where the couple lived at Clarence House, ‘hideous.’ As for her husband, it was obvious that she found his heavy drinking and his evil temper exasperating. She was relieved when he went back to sea. Nevertheless, the couple had five children. Their son Alfred died in 1899 at the age of 25 of a self-inflicted gunshot wound. Marie died in 1920 at Zurich. 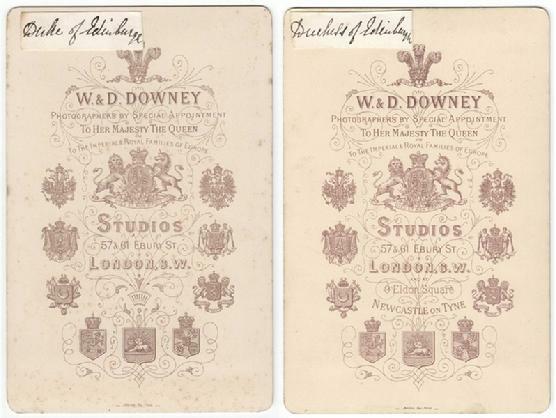 Both portraits are by William and Daniel Downey of London and Newcastle. Condition: please see scans. Both prints present some spotting and a slight loss of tone at a couple of their edges but have good tonal range. His mount presents a small amount of foxing on its reverse but is otherwise clean, firm and solid. Her mount is in excellent condition. Dimensions: the dimensions of a standard cabinet card are approx. 6.5” by 4.3” (16.5 cm by 10.8 cm).